What is the Protect Native Culture™ Plate? Who can pre-order these plates? Where will the fees go? If I already own a personalized plate, can I keep it? I currently have a different specialized plate – can I switch to the California Protect Native Culture Plate? How long will it take to get the plates? What will you do with the information provided on the order form? I have a disabled plate. Can I still get Protect Native Culture license plate? What do I do if I move or have a change of vehicle before I receive my California Protect Native Culture Plate? What are California Native American cultural resources? What is the California Native American Heritage Commission? Who designed the Protect Native Culture™ Plate? Why is there a California Native American Basket on the Protect Native Culture™ Plate and whose basket is it? 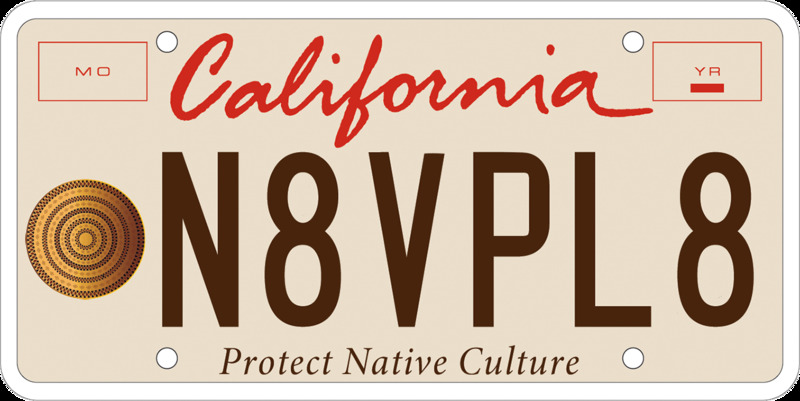 The Protect Native Culture™ Plate is a Special Interest License Plate benefiting programs of the California Native American Heritage Commission, a California State commission, that preserve and protect California Native American cultural resources protected under State law. Pre-order the Protect Native Culture License plate by clicking the Order License Plate Button above. Once we reach the minimum 7,500 pre-orders required by statute, all of the applications and funds will be forwarded to Department of Motor Vehicles (DMV). It then takes 10-12 months to implement the program and start processing the orders. If NAHC does not collect the required 7,500 pre-orders within one year, an extension for one additional year may be requested. If NAHC does not reach the required number of pre-orders within the time allowed, the applicants will receive a full refund of their pre-order payment. Anyone who has a current California-registered vehicle, including automobile, truck, trailer, motorcycle, or commercial vehicles, may order the Protect Native Culture™ License Plate. The Protect Native Culture™ License Plate costs a fee in addition to your normal vehicle registration fee. To pre-order a sequentially numbered plate (a random set of six numbers and letters selected by the DMV), the initial cost will be $50 and $40 annually to renew plus your normal vehicle registration fee. Personalized Protect Native Culture™ plates (where you select up to six numbers and/or letters) cost $103 ($83 per year to renew plus your normal vehicle registration fees). Some portion of the Protect Native Culture license plate purchase price may be considered a charitable contribution that maybe tax deductible. For questions about your taxes, consult a tax professional. A portion of the Protect Native Culture™ License Plate purchase price and renewal fee maybe considered a charitable contribution and maybe tax deductible to the extent permitted by law. For questions about your taxes, consult a tax professional. Be sure to use the hashtag #ProtectNativeCulturePlate whenever you can! If your personalized auto plate has six characters or less, you can keep your configuration. The addition of the logo on the left side of the plate takes the place of the seventh character. Because of this, the maximum number of characters allowed on the auto plate is six and motorcycle is five. . Your registration fees will include the cost of the personalization (your six chosen letters and/or numbers) plus the cost of the Protect Native Culture™ License Plate. Yes. Converting from another specialized license plate will cost the same as setting up a new Protect Native Culture™ License Plate, $50 for a sequential numbered plate or $103 for a personalized plate. It can take as long as 2 years to collect the initial 7,500+ pre-paid applications. Then will take another 10-12 months to implement the Protect Native Culture license plate program. Once the program is implemented, DMV will start processing the orders. For sequential license plate orders, when the order is processed, the license plate will be assigned to the vehicle indicated on the order and mailed out, which may take 7-10 business days. For personalized license plate orders, the review and production of the personalized plates may take 10-12 weeks and will be distributed to the DMV or Auto Club office indicated on the application. Once received by the designated office, a post card will be sent out notifying you that they are available for pick up. Yes. You may give a Protect Native Culture™ License Plate as a gift. Go to the Order License Plate page and complete the web or paper pledge form and fill it out on behalf of your gift recipient. The person receiving the gift must have a current California registration for the vehicle they plan to place the plates onto. We will not share your information, send you unsolicited emails/mailings, or make unsolicited phone calls to you. You do have the option to sign up for future information. Your information will only be used to contact you regarding your Protect Native Culture™ License Plate order. Yes, if you are willing to replace your disabled person license plate with a disabled person parking placard. It is not possible to get a combined Protect Native Culture/disabled person license plate. However, you can get Protect Native Culture license plate and display a disabled person parking placard in the vehicle to receive the parking privileges. California Native American cultural resources are sites, features, and items that are of sacred, religious, ceremonial or historical importance to California Native Americans from time immemorial. They are all around us and have been for thousands of years, even though most non-Native people do not know their meaning to California Native Americans. California Native Americans typically do not discuss the location or meaning of their cultural resources to protect them from looting and vandalism since, once damaged, they cannot be replaced. The California Native American Heritage Commission was created by legislation authored by the late Assembly Member John T. Knox (AB 4239) and signed into law by Governor Edmund G. Brown Jr. on September 29, 1976. It is an autonomous nine-member body whose authority encompasses the protection of Native American cemeteries and sacred sites. At least five of the nine Commission members shall be elders, traditional people, or spiritual leaders of California Native American tribes who are nominated by Native American organizations, tribes, or groups within the state and appointed by the Governor with the advice and consent of the California State Senate. (Public Res. Code sections 5097.91, 5097.92). The Protect Native Culture™ Plate was designed by Curtis Corona, a Sacramento-born film director, writer, producer, and visual effects coordinator. The design was intended as a prototype to give the NAHC Commissioners and the public an idea of what the plate could look like, but the NAHC Commissioners liked the design so much that they voted to adopt the prototype as the final design. California Native American tribes are uniquely known throughout the world for their intricate basket weaving artistry, and their baskets are featured in museums around the world. The image of the basket featured on the Protect Native Culture™ Plate is the image of a rattlesnake basket from the Tule River Tribe (http://www.tulerivertribe-nsn.gov/), a sovereign federally-recognized California Native American tribe whose reservation is located near Porterville. The Tule River Tribe licensed the image in perpetuity as a gift to the NAHC in honor of Tule River Tribe member Judge Cynthia Gomez, Governor Edmund G. Brown Jr.’s first Tribal Advisor appointed pursuant to his Executive Order B-10-11, and in honor of Judge Gomez’s many years of service to the people of the State of California with the Department of Housing and Community Development, the Department of Transportation, the California Environmental Protection Agency, and the California Native American Heritage Commission. Q: Can I get a special character on my Protect Native Culture license plate, such as a star, heart, hand, or plus? A: No, those special characters are only available on the Kids license plate. Q: I lease a car. Can I still get Protect Native Culture license plate? A: Yes, as long as the lessee listed on the vehicle registration. Q: Will I receive one or two license plate? A: You will receive two plates for auto or truck (commercial) and one plate for motorcycle or trailer. Q: Will I receive registration stickers with my new license plate(s)? Q: Can I pick up the Protect Native Culture license plate without assigning to a vehicle? A: No, the license plates must be assigned to a currently registered vehicle.